Your pet's health is just as important as your own. 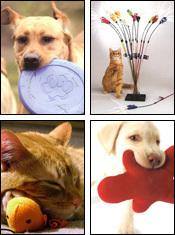 A pet's diet, the biggest health variable controlled by its owner, is crucial to its well-being. That's why selecting a healthy and tasty pet food is the most loving choice you can make for your pet. Fromm offers a wide variety of Premium & Gourmet recipes using only ingredients of the highest quality. This concentrated, balanced blend of foods result in easier digestion, fewer allergic reactions, and increased energy for your dog and cat. Fromm Family Foods exclusively formulates super-premium & gourmet pet foods with low ash contents, pet foods containing high-quality protein, and pet foods containing the proper contents of balanced fat and mixed carbohydrates. Fromm uses only natural preservatives and ingredients, no artificial colors or flavors…just natural goodness and taste. The comforts of home are things that we all love, including our four-legged companions. They have their favorite chair, smells, routines, nap times and TV shows just like us. Merrick has done their best to bottle up all those great things that make up the comforts in life and offer them to your pets through these wonderfully healthy foods. Let's play! Some like soft and plush. Some like strong and rugged. Most like the SQUEAK! We've got them all - suckable fleece, original tennis, flying, spinning, floating and tugging. Kitties will enjoy our premium catnip toys and feather wands. MEOW! and I outran the wind. and play beside the sea!